The Glendale Collection is a treasure-trove of local history and genealogy, and is the newest in the Wilbraham Public Library’s collections in the Digital Commonwealth. The collection was in an unlabeled box of miscellaneous photographs found among our uncatalogued collections. We gave it the name Glendale Collection because several of the people and places featured were from that section of town, up the mountain on Glendale and Monson roads. Genealogists especially would be interested in the portrait photographs of families that lived in that area. Seavers, Bennetts and Benedicts are among those featured. 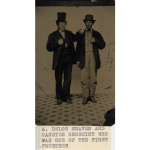 This one of Allyn Delos Seaver and his brother-in-law Cassius Benedict is one of the oldest in our collection, as Cassius died in 1872. They were both trustees of Glendale Methodist Church. In addition to the men’s dapper dress, I love the detail of the patterned floor they’re standing on. Most of the photographs in the collection are from the early 1900s. Several feature the ceremony on June 20, 1913, unveiling a memorial boulder for Wilbraham veterans at Glendale Cemetery, an event that served as the third day of festivities during Wilbraham’s 150th celebration. 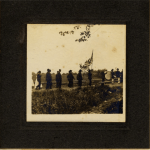 Though unnamed, the men in this photograph were veterans of the Civil War, and were honored in the ceremonies that day. These are just a few highlights that can be found in these and other photographs in Wilbraham’s local history collection. We only digitized photographs we were reasonably sure were in the public domain, so if you’re interested in seeing more come to the Wilbraham Library during our regular hours and we’d be happy to give you access to the full collection. Posted in Spotlight on....Tagged Glendale, Wilbraham MA, Wilbraham Public Library.